The one thing Donald Trump had going for him [and the one thing he bases his whole campaign on] is the polls; both the state and national polls. He pointed out how he was winning every poll and winning by huge margins. Of course, in the first state where actual votes took place in the caucuses, Iowa, those polls didn't help him from being a second place loser. With the myth of Donald Trump's invincibility utterly shattered to pieces with the Iowa results, we now have the latest poll that shows that his invincibility, as represented by the national polls, may also be shattering. Here is the latest from the Public Polling Policy [PPP] national poll of Republicans who will be voting in the primaries: "PPP’s newest national poll finds the race on the Republican side tightening considerably in the wake of Donald Trump’s surprise loss in Iowa on Monday night. Trump’s lead has fallen to just 4 points-he’s at 25% to 21% each for Ted Cruz and Marco Rubio....Trump’s 25% standing reflects a 9 point drop from our last national poll, which was taken the week before Christmas." Donald Trump. If the election was today, who would you vote for? 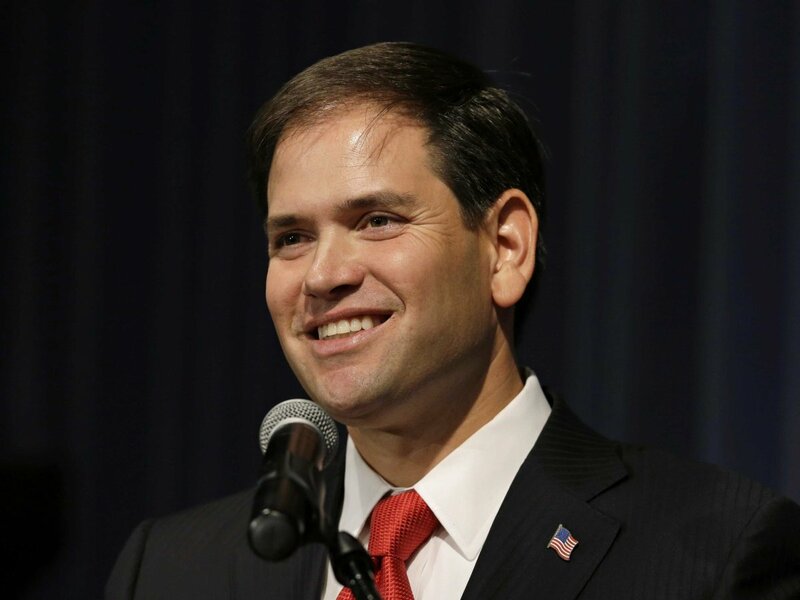 There is even greater news for Marco Rubio when the Republican field narrows to fewer candidates. This is exactly what I predicted two months ago in my post of "Why the GOP Ticket Will Be Rubio/Cruz", that as the field becomes a three person race, because Cruz and Trump will be basically splitting much of the same "outsider" vote, Marco Rubio will be be getting a plurality of the vote and therefor winning most of the states when the field does narrow. This from the PPP web site: "Things also bode well for Rubio as the field gets smaller in the coming weeks. 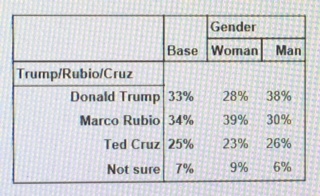 In a four candidate field he gets 32% to 31% for Trump, 23% for Cruz and 8% for Bush. In a three candidate field he gets 34% to 33% for Trump and 25% for Cruz. 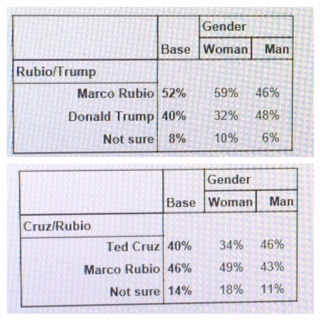 And in head to heads he [Marco Rubio] leads both Trump (52-40) and Cruz (46-40)."